I love great bird photography, I truly do. Photos that capture great behaviour, and the incredible beauty of birds. Great photographs also inspire me to try and do better with my own photographs. Inspire me to try a little harder to get that composition just right, to get that jaw-dropping moment. Should I worry about how those photos were obtained? 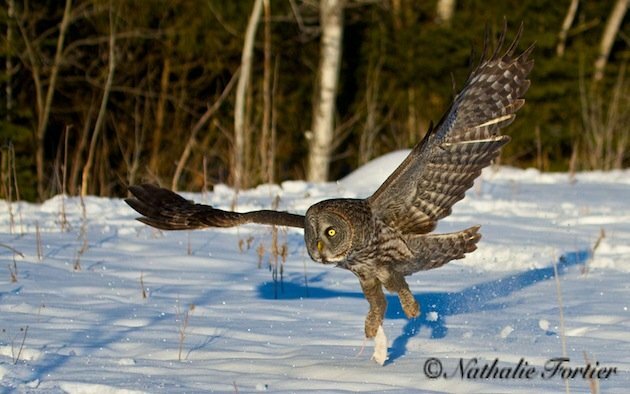 I have to say that pretty much every time that I see a great photo of an owl in flight, swooping down from a perch or low to the ground, in invariably think to myself “that was baited”. I might be wrong, but I’m willing to bet that I am right far more often than I am wrong. It bugs the heck out of me, but should it? 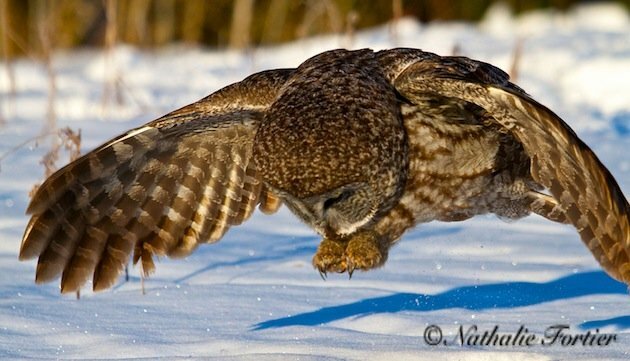 I have a friend in Ontario, who has been excitedly searching for Great Gray Owls during this winter’s irruption. I regularly see messages from her, and we’ve talked back and forth about her forays out and about to look for them. Today she found her owl. The owl was attended by about 20 other people, photographers and birders. 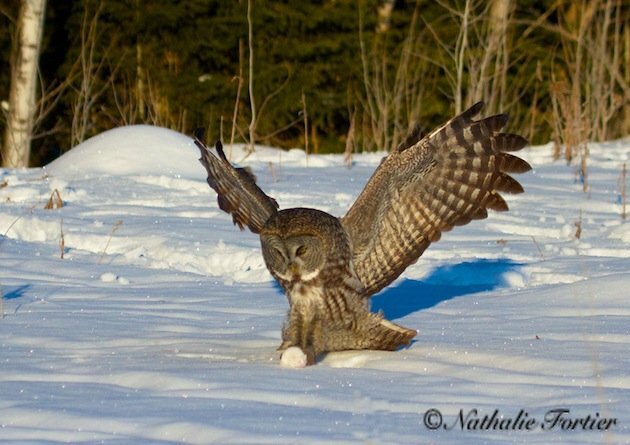 She got out and began taking photos and quickly realized that the owl was being baited with white mice. She took some photos, and though she was uncomfortable with the baiting, she thought that the opportunity for some great photos was to great to pass up. But as she stayed and mice were being tossed out, she decided it wasn’t for her, and she left the birds, and the group. At the end of the experience, she posted her photographs clearly stating that the bird was baited, and leaving the mouse in most photos. She has clearly decided that for her baiting is not away to get a photo, and if one does get a photo that way then the ethical thing to do is to state that, much as one should do with captive animals. My own take on that mirrors it. Quite simply, I don’t like it. I question the release of non-native mice into the wild. Oh yeah, most end up as owl pellets, but surely the odd one escapes a talony death. And I question whether it is a good thing for the owls. Yes they are getting fed but is the net result of having to forage for food so close to people (the photographers in this equation) more stressful for them? How do birds that are already stressed, such as many of the Snowy Owls in the south this year are, fare? I am well aware of the debate that this is no different than photographing birds at a feeder, but for me it feels different. One wouldn’t tether a rabbit out to get a shot of a fox or a coyote, or is that somehow different? An obvious difference to me is that, unless I’m unaware of the practice, people aren’t leaving the mice out for the good of the birds, going back every day sans camera. If they are doing it solely to capture the photo it isn’t aid it is exploitation. And as Ron Dudley shows, it goes beyond live mice, as he documented a whole chicken being left out by someone to attract raptors. At least a chicken would last awhile as a feeder. But that’s me, what do you think? Where do you stand? I know where I do. Clare Kines is a retired Mountie and a failed businessman, which apparently qualifies him to be the Economic Development Officer for Arctic Bay Nunavut. Raised in Manitoba, Clare has lived in three provinces and two territories, managing to get kicked out of all them except this last one. So far. He has had a lifelong love of nature, never growing out a child’s curiosity. Given a Peterson’s guide by his grandfather, he made birds a big part of that love. He’s led tours to the high Arctic and Cuba, and writes probably the most northerly blog in the world, The House and other Arctic musings. He considers himself the luckiest man alive, having found great love twice in his life. His first wife, Janice, passed away in 1996. After moving north he met and fell for Leah. They have two fantastic children. He lives in an incredibly beautiful, magical part of the world - a place few people get to know. Very well put, Clare. I am in 100% agreement with you and the selection you shared from Mike McDowell’s blog. It is unethical and unnatural and IMHO dangerous for the birds we claim to love by possibly altering their perceptions of humans from predators to providers. For me it’s just wrong period. If you want to get good photos of an animal, learn their behavior and wait for the animal to show the behavior you want to film, then take the shot. Clare, thank you for covering this important and contentious topic. I’m firmly against baiting, as you, Luisa and Larry all stated. There are incidents of owls being baited close to roads, putting their lives in jeopardy. There’s the issue of habituation and of introduced pathological organisms from domestic mice. There is stress, sometimes imperceptible, from this type of human intrusion. And, there’s also the significant issue (for me) of using a live, sentient animal to bait another animal for a photograph. I could never, in good conscience, do that. I also agree with Larry that field craft, patience and ethics are a huge part of a great photo. They are the foundation and the subtext upon which that photo stands. Those qualities are undermined when ethical considerations aren’t observed, and when the well-being of the animals (predator or prey) is secondary to the prize shot. Frankly, when I learn that people are live baiting animals, or baiting without admitting it (or even lying), not only do I lose respect for the photos, I lose faith in the photographer. Every time I see a great shot from that same person, I suspect ulterior methodologies that aren’t being revealed. Lastly, you mention Ron Dudley in the post. He’s a shining example of how a person can achieve stunning photographic results, all the while living by a very strict code of wildlife ethics. I admire Ron immensely for that. And I love his photographs that much more for the sound and diligent methods I know he employed to get the shots. I don’t bait and I don’t think it is ethical to bait. I delete images I later find out were baited like the Harriers at Farmington Bay WMA that were baited (unbeknownst to me) by someone tossing a chicken into a hidden location so they can get shots of raptors where they want them to be. It was mentioned in a post about the baiting that if chickens (including the chemicals in them) were ok for humans to eat it would be okay for the raptors. Those chemicals were tested and shown to be safe for humans, I am certain that there was no mention of the chickens preservative were proven safe for a Northern Harrier, anywhere. Besides, at one point the government said DDT was safe and they were wrong then. I get my images by being in the field, not baiting, not calling them in and by waiting patiently, getting to know my subjects and anticipating their behavior. If I can’t get the images that way then I just won’t be taking them. I will always put the birds (or animals) welfare ahead of a photo. I really am waiting to see a pro-baiter argument, although I’m not going to be the one to provide it. However, I am hoping that those questioning the morality of sacrificing a live creature for a raptor snack are vegan/vegetarian, or else it is a difficult argument to take seriously…”do as I say, not as I do”, you know the drill. Steve, it appears that comment is directed at me since I’m the only one who mentioned that aspect. So, yes, I’m a plant-based eater, no meat, dairy, etc. I abstain for both personal and wildlife reasons (climate effects, predator control policies, etc). But that’s immaterial to my point. My point was that I personally have an issue with using a live, domestic animal to bait another animal for the purpose of a photo op… very often a picture that’s simply used to collect accolades at a photo site. I see it on Flickr and 500px frequently. No matter what the species, I view that as a frivolous waste of a life, and as I wrote, I personally could not do it. I’m no stranger to predator prey relations, in the field and in my work, so it’s not an uninformed or hypocritical view to hold that concept dear to my heart. @Steve: I don’t think your vegetarian argument is a very strong one. There should be a difference between killing an animal for food or for fun. I am not a vegetarian. I am okay with killing animals for food – some animals (when given the chance) would kill me for food. I am okay with killing animals for reasons of conservation, e.g. controlling herbivores, invasive species etc. However, I have major reservations agains killing animals purely for entertainment (trophy hunting is in the grey zone as it can contribute to conservation under certain circumstances). Killing an animal only to get a pretty picture is ethically not okay, even to non-vegetarians, in much the same way that a pigeon shoot is not okay, even to non-vegetarians. Having said that (my previous comment), I think there is little to be said against baiting that doesn’t also apply to backyard bird feeders, growing corn / sunflowers for human consumption, the “producing” of roadkills, or the wild garbage dump of a remote community. People provide food resources and thereby alter animal behaviour and populations. Whether on purpose or not is insignificant when looking at the ecologic effect. However, to my eye the pictures baiting (be it mice or the backyard feeder) provides are rather boring. I am a birder, and I use bird pictures to get a sense of the observation, experience the situation vicariously through the lens of someone else. This “out in the field” effect is totally lost at feeders, or at baiting stations, or at artificially provided perches. Heck, I don’t even enjoy watching birds at feeders when I am in “birder mode” (not in my kitchen drinking coffee and looking at my feeder, but out in a nature reserve where feeders are provided at the information centre). To me, it’s cheating, it’s too easy, there is no search and serendipity, and that makes it boring to see, be it live or on a picture. Jochen, I really like your point about the nature of baited photos. It’s a great observation and an argument against baiting you don’t hear often, one that might actually appeal to people who couldn’t care less about the ethics of it. Thank you. Oh, and, I agree. Sometimes it’s hard to tell what someone did for a photo, but seeing obviously staged shots leaves me cold in the same way. I’m a “decent amateur”, both in birding and photography. I’m crazy about photography and spend many an hour looking at photos. After just a short time, I found myself completely bored with these obviously bated photos. They all start looking the same…just a difference species sometimes. But what I keep going back to is my 2nd year of birding. For various reasons that I won’t get in to, I found myself birding by myself. I had to rely on taking photos in order to go home and I.D. WTH I’d seen. I found the only way to get anywhere was to be quiet, slow and observant–willing to become part of where I was. To make a long story short, I came home with some wonderful finds and ended up the one to have found 3 notables out of 6 for the season for our region–complete with photos to prove them…much to the annoyance of all these more “experienced” birders who had little patience for a newbie. No recordings…heck, little knowledge of my subjects. The biggest thing I didn’t do is manipulate the very things I was falling in love with…and I got the bird 🙂 That is how I’ve continued to bird, and though it’s fun to add to my list with others help of some kind, there is nothing like just me and them! Nothing. I will let anyone photograph me all they want if they bait me with Buffalo Wings. That being said, everyone can find fault with something someone does. A photographer uses bait, people use seeds to attract birds, use recorded calls to lure them out, people drive hundreds if not thousands of miles burning precious natural resources, people trampling acres of habitat to flush a bird… The list can go on and on. When you really think about it, the only ethical thing to do is not look at birds at all. Then an only then, can you take the moral high road. Will, Although I agree with much of what you say, I don’t agree with your conclusion that the only ethical thing to do is not to look at birds. I don’t “pssh” at birds for the same reason many people find baiting unethical. I don’t travel to go birding because of the cost and the energy conservation issue. I bird in my own local patch, which I enjoy quite a lot. I’m quiet and as still as I can be, and I thoroughly enjoy watching birds and other animals around me. I wouldn’t get much pleasure in being driven to a spot where others have found a rare bird species, rush out of a van to see it and then head off to the next spot. To me, that isn’t birding, that’s some kind of a game people play in the outdoors. Observing wildlife and studying plants, as well as birds, gives me a great deal of pleasure and enhances my knowledge and appreciation of this incredible planet we share with other living creatures. I had been unaware of the practice of baiting until I read this article, because I am strictly a casual birder. But I agree that it is wrong, for all the reasons stated. Baiting is fraught with all sorts of issues. For me, the thrill lies in the surprises I get when I’m out and about, or sometimes even at home (like the day we saw a prairie falcon kill a grackle on the roof of the house across the street, and then got to watch what it did). If I want to photograph birds in a set-up situation, I’ll go to a zoo, where there is no deception and no impact on the natural world around us. I apologize for starting a conversation and not joining it, but unfortunately my daughter took sick and I have been away from the interweb for a week. I’m still away from home but with great wifi, and a sleeping daughter. And I don’t know where to start, its a little easier to join the comment conversation as they come in, at least for me. And truth be told my mind is elsewhere, what is left of it from lack of sleep anyway. I appreciate the point of views and for people thinking about this. I will, because its an easy response to make, reply to Jochen. I think there is a difference in feeding birds at a backyard bird feeder and baiting animals. The difference is this, people don’t put out a feeder, take some photos, and then move on once they get the shot. I’d subscribe to that pov if the people tossing mice out to the owls go back day after day to feed them. Although I still have reservations about the practice surrounding the species that are being tossed out as fodder and the chance, small or otherwise, of a breeding population of non native species being established. Thanks to everyone for joining the conversation. Its been fun reading everyones thoughts. I have yet to see a valid reason as to why baiting is bad or unethical or not “nature photography”. Getting close enough to any wild animal to photograph it means you have to get the animal comfortable with human presence which based upon most arguments should be considered dangerous and/or unethical to the animal. As with most protesters there is so much hypocrisy fed by complete ignorance. Most owls require at least 15 mice a day so I highly doubt they lose any ability to hunt after being tossed a few pet store mice. It’s not hard to catch and breed wild mice either. We have over a dozen species of wild owls and many other raptors all over the province and around my house. I’ve seen many species get baited all over the place. The population seems very healthy, the migrating birds come back every year. Nobody is finding dead raptors. Wild and domesticated animals and humans get hit by cars all of the time so that argument is just ridiculous and extremely hypocritical because we all drive. There is no threat to the raptors from baiting in my area. They are all healthy wild animals that live among humans. Stay in your inner city homes or stay quiet because the second you go for a hike in the wilderness you are putting human impact on wildlife… and there is nothing wrong with that. IMO.